Dealing With Indiana Termites - Yes Pest Pros, Inc. Dealing With Indiana Termites - Yes Pest Pros, Inc. It is easy to get confused when dealing with termites. In fact, the common belief is that no matter where you live you may have to deal with all different kinds of termites. This is only slightly true. It is possible to deal with many types of termites in all areas of the United States. However, some termites are more common than others in various locations around the nation. In Indiana, specifically, the most common kind of destructive termites are the eastern subterranean termite. They pose a risk to all homes and buildings which are made from the Douglas fir or other common types of timber. They will eat the spring wood over the summer wood. This behavior means that when these termites are done with a timber there is a thin shell left. With only a thin shell remaining, the building or furniture is in jeopardy of being completely destroyed. How do you know if an infestation of eastern subterranean termites has occurred? You might see these termites, as some of them are swarmers who are swept in by the wind. However, the chances of seeing them to determine an infestation is slim. The most common way that people determine that their home or building has been infested with these termites is seeing the mud tubes created by the eastern subterranean termites. Once you see the mud tubes you have probably already had some pretty significant damage to your home or building. Due to this unfortunate issue with these termites it is recommended to have a regularly scheduled termite inspection done on your home. Why can’t you see these termites entering like you can many others? The swarmers are the only eastern subterranean termites which may enter your home above the ground level. As a rule, the eastern subterranean termites will enter your home at the ground level or even below the ground level. Some common entry points for these termites include in-fill patios, fire hearths, expansion joints, and cracks in concrete slab flooring. How do you keep these termites away? 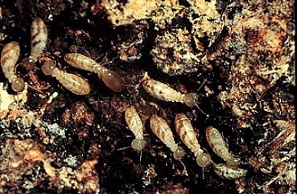 The eastern subterranean termites prefer to live in warm, dark, moist places. So, this means that if you keep water sources to a minimum around your home then you would be limiting the water supply for these termites and would then be less likely to become their next home. Also, if you keep your home cool they will be less likely to invade. What do you do if you suspect that the eastern subterranean termites have invaded despite your best efforts to keep them away? In this case the best thing that you can do is call a termite exterminator. Your exterminator will first come to your home and do a thorough inspection in order to determine for sure if the eastern subterranean termites are the problem at hand. Once they affirm that these pests have begun to fulfill their appetite on your wood, they will work with you to implement a plan for getting rid of them.